27 August. We made it! 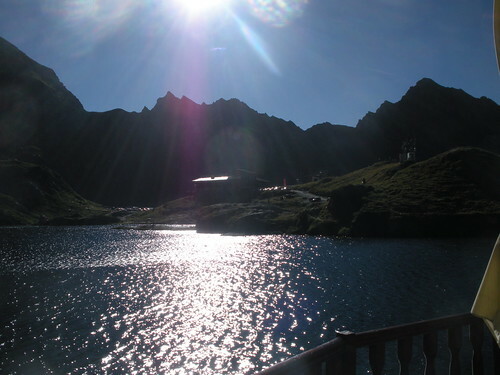 We are at Cabana Balea Lac, about 2000m above sea level. We left Sibiu early and rode in the cool sunny morning through quiet countryside and villages to avoid the main road. We passed several flocks of sheep that were watched by shepherds and had another dirt and grass road section for awhile. A couple of times dogs chased us in a threatening manner but we were able to outrun them pretty easily. Cartisoara is the village at the northern end of this road where we stocked up with water and prepared for the climb. 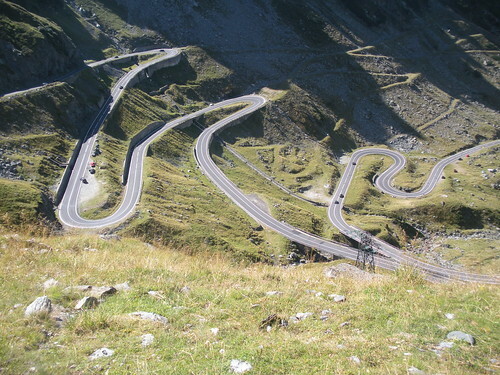 The road is really an engineering folly as there are other easier routes over and through the mountains. The first 12km up to the Balea Cascade are well graded through forest that provided welcome shade. There are many souvenir stalls here, eating establishments and a cable car to the summit. The final 12km is the most dramatic section where the road ascends to the top of the waterfall, then enters a hanging valley above the treeline and snakes its way up with switchbacks all the way to the top. The views are incredible. This is a popular tourist road and there was quite a lot of traffic, but adequate road space for us as well. Some people who travel this road appear to be happy to leave it in a worse state for the next travellers by leaving their rubbish along the way. An area like this in many other countries would be a national park. Romania is either not able or not willing to protect this place and this is understandable given that it probably has few resources and other priorities. It is sad to see Lake Balea, a beautiful alpine tarn, just below the summit, overwhelmed with tourist development. That said, we are staying here ourselves. It is a popular hiking area and you can walk to the top of Moldoveanu, Romania’s highest peak. We also saw a flock of sheep grazing above the lake, then watched them being shepherded down at dusk (don’t know where to). This entry was posted on 28 August 2010 at 5:31 am and is filed under Romania. You can follow any responses to this entry through the RSS 2.0 feed. You can leave a response, or trackback from your own site. Oh my god! i watched the slideshow on fickr before i read the blog and got the impression youe went DOWN the mountain. Now I’m doubly impressed. What stops the sheep from straying on the road? Is it an old glacial valley? Hope it was nice weather for that up-hill climb! more pix of uke playing please. love from the adelaide fans. Hi Kate – just passed a couple of french cyclists going up as we were going down. She had her violin in its case strapped on top of her panniers. I predict she won’t have much energy left for violin playing tonight. And they are camping. Will try harder for uke pics – main prob is lack of energy and fellow ukers.